I like my running hat so much I decided to design a knitterly version of it. Birdie is a trim hat with a petite brim. It is knit in the round from the bottom. On top, the cables twirl together in a sunburst design. Just like the classic baseball caps which inspired it, Birdie is topped off with a button. Made from lightweight yarn, you won’t have to wait for cold weather to wear Birdie. Knit it in a luxurious silk and merino blend, or choose an affordable soft acrylic. Birdie also looks great as a beanie. 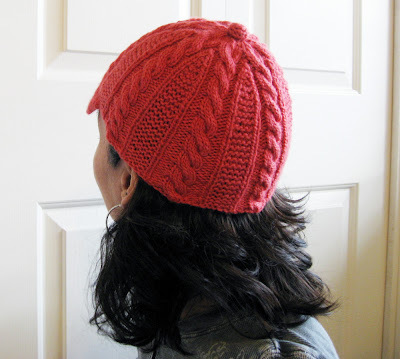 Instructions for a brimless version are included at the end of the pattern. Yarn: 150 yds (135 m) of dk/sport weight yarn. 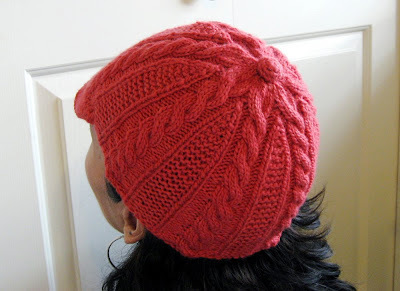 The orange-red hat was knit in Manos del Uruguay Silk Blend, 30% silk, 70% wool, in color 3069. 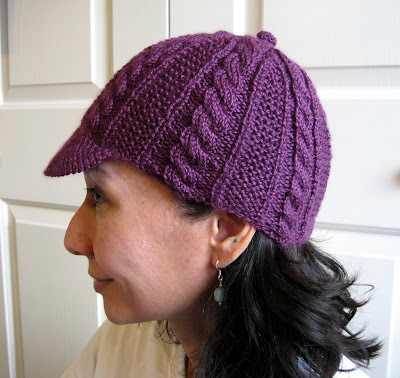 The purple hat is in Bernat Satin Sport, acrylic, in plum. Choose substitute yarns that have some elasticity, and that will meet the gauge below. Gauge: 23 sts, 38 rws per 4 in. in st st. One 16 st pattern rep at cast on edge, where it is stretched, is 2.5 in. One pattern repeat, relaxed, is 2 in. Size: One size fits most teens and adults. Finished hat at bottom band, before brim is attached, is 14.25 in, after brim is attached, 17.5 in. Hat will comfortably stretch up to about 23 in. The brim is 1.75 in deep by 5.5 in wide. It is adorable - thank you so much for sharing that! 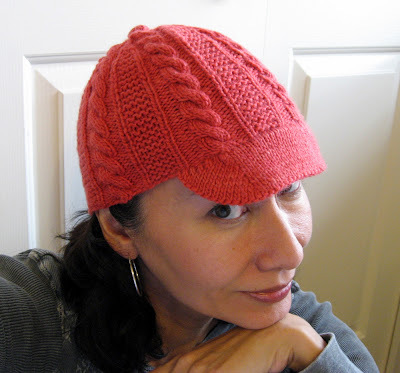 Came to your blog via the link from L&V for this adorable hat - I've been looking for a pattern and this is perfect! I thought I recognized that river in your banner photo and then see you are in Vancouver - I'm in Hillsboro! Can't wait to make the hat. Now I'm going to check out the rest of your blog. How cute is that? Thank you!